The Qur’an and the Sayings of Prophet Muhammad (PBUH) are the two main sources of knowledge in Islam. The Qur’an is a divine revelation inspired to Prophet Muhammad (PBUH), that guides us to the truth, and has principles that improves our character and behavior. Prophet Muhammad (PBUH) applied Qur’anic teachings in his character and behavior, and therefore became an example to follow. The Prophet (PBUH) lived more than 1400 years ago, in an environment different from our society today. He addressed issues, and answered questions, and gave advice that is relevant today. His sayings need to be understood in historical context and in the context of the Qur’an. 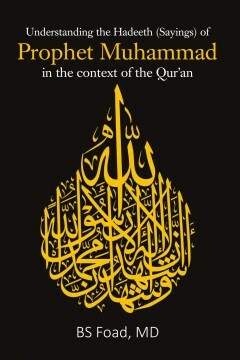 This book examines some sayings of the Prophet and explains the concepts and morals in his Hadeeth (sayings) in the context of the Qur’an, and how we can apply these principles and teachings in our life. Both the Qur’an and the Sunnah (tradition) of Prophet Muhammad (PBUH) guide to what is right, and improve our character and behavior, and make us better human beings, aware of our accountability to God. has studied religion and have a BA and MA in theology. Dr. Foad wrote several books on Islam, the Qur’an and Prophet Muhammad, including: God’s prophets; Accountability; The Seerah (life story) of Prophet Muhammad; Noble character: 3 volumes; The Qur’an: its message and concepts; Understanding Islam: views of a moderate Muslim; What Christians should know about the Qur’an & Muhammad; Understanding the New Testament in the context of the Qur’an; Understanding the Hebrew Bible in the context of the Qur’an; Explanation of Qur’anic verses: 3 volumes. The current book is an attempt to learn and understand the Prophet’s sayings in the context of the Qur’an, and to present the Sunnah (sayings of the Prophet) in a clear and logical way, in order to improve our character and behavior. He has been involved in interfaith dialogue for 35 years, and taught at the Islamic center, Universities, churches and synagogues about Islam and the Qur’an. He is a founding member of the Islamic center in Cincinnati.